Female patient 49 yo from Phu yen province. Slight edema, 2 leg weakness for 2 years, using wheelchair to many HCM hospitals. She went to Medic Center in hope to make clear her illness. Chest X-Ray: deformation of chest bones and osteoporosis. Column vertebra : biconcave of vertebral bodies due to osteoporosis. 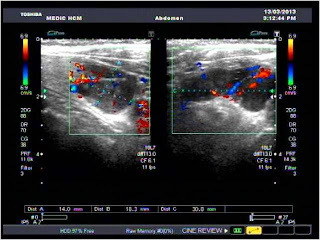 Ultrasound at Medic revealed a hypoechoic mass in the lower pole of left lobe of thyroid, and hypervascularization which was thought to be a parathyroid tumor. PTH highly raising up of 1,048 picog/ml [16-65 picog/ml] and bone scan proved osteoporosis. In 2 hours post op, PTH dropped down of 47.21picog/ml. And microscopic result= Parathyroid Adenoma. 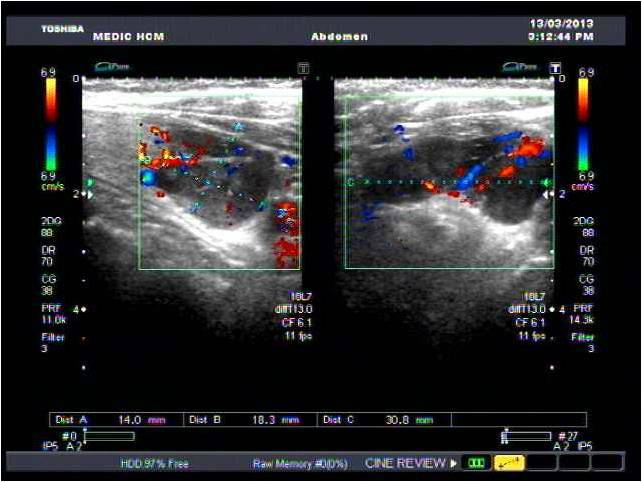 So it is an severe osteoporosis case due to parathyroid adenoma that is unveiled successfully at Medic Center in some days while it lasted for the female patient in 2 years in her wheelchair.